Organizers of Cayman Carnival Batabano are bringing back its signature dinner show, Le Masque, at the historic Pedro St. James Castle this year, featuring “The Violin Queen”, Mapy, with her unique fusion of Soca and Afro-Beat violin music. Held on Thursday May 2, 2019, Le Masque is an exclusive dinner and show event offering local residents and visitors an elegant dining experience under the stars. "Le Masque is definitely back by popular demand this year and we are so thrilled to have Mapy as our headlining artist performing at our historic Pedro St. James Castle, along with some of Cayman's top local singers," said Batabano Chairperson, Donna Myrie-Stephen. "Mapy's amazing talent of fusing elegant violin with Caribbean and afro-beat music is a perfect fit for an event like this at such a prestigious location in Cayman, and we are so excited to host her here." Event attendees will dine on a buffet of traditional Caymanian cuisine, including lobster, conch, and Cayman-style beef, among other local dishes and desserts. Mrs. Myrie-Stephen said the dress code has been elevated to "island elegant" this year, in-keeping with the event's "masquerade" theme infused with local culture, and guests are encouraged to wear creative headpieces and masks of their own. A charitable raffle will also be held throughout the evening, with part-proceeds going to local environmental and turtle conservation. Tickets are just CI$100 and includes: a masquerade mask; champagne cocktail hour; elegant Caymanian cuisine dinner with wine; and international and local entertainment. There will also be a cash cocktail bar. Tickets are now available for sale at Le Classique on Mary Street where tables of 10 can be booked, or individual tickets can be purchased online at www.eventpro.ky. Sponsorship opportunities are available for the local business community to support and get involved with this event. For details, call 949-7121 or email batabanocaymancarnival@gmail.com. 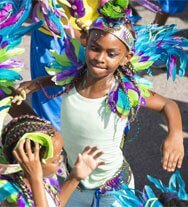 For information about Cayman Carnival Batabano 2019, visit www.caymancarnival.com.